Judge Judy is offering advice to women free of charge. Television's most popular judge is celebrating the 19th season opening of her syndicated show Monday by offering her new book, "What Would Judy Say: Be the Hero of Your Own Story," for free to anyone who wants it. The book offers plainspoken advice primarily for women, telling them not to let anyone besides themselves define what makes them happy. It is filtered through stories of the charmed life of retired New York Family Court Judge Judy Sheindlin. She can afford to be generous. 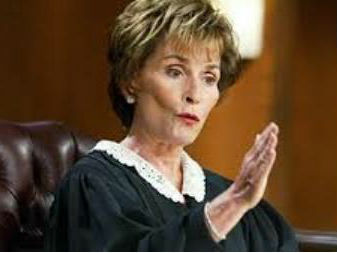 With "Judge Judy" atop the daytime TV ratings, TV Guide reported last year that Sheindlin is by far the highest paid person on television with an annual salary of $47 million. She hasn't commented upon or disputed the number. "You should want to give something back," she said. "If you can share with the people who've been good to you ... do it. Not everything has to be a money-making operation. You do things sometimes because it makes you feel good." Sheindlin has written a handful of books, starting with 1996's "Don't Pee On My Leg and Tell Me It's Raining." She said her stepdaughter encouraged her to write the latest one. The 71-year-old TV jurist is signed to continue her show through 2017. With ratings continuing to grow, she doesn't see an end in sight. "Am I tired? No," she said. "Do I still get a kick out of what I do? Absolutely. I always say that when I see that needle start to go in the other direction, when people have had enough of me, I'm going to be smart enough to say goodbye. It's such a joyous ride to be on top, and it takes away from that ride if you sort of ride it down." Fully recognizing and admitting that the moment has come isn't always easy, but Sheindlin insists she will. "I hope my eyes are clear enough," she said. "Certainly the Nielsen prelims (ratings) are published every Thursday and you'd have to be sightless not to see them. You may not want to see them, but they're there when you want to see them." Instructions on receiving a downloadable copy of her book are available on her website, www.whatwouldjudysay.com, starting at 10 a.m. Monday. Ten thousand paperback copies of the book are available, with first choice given to people who have contributed to discussions on the website. Arrangements for the book to be distributed in other formats at a later date are still being worked out, spokesman Gary Rosen said. After a summer break and vacation in Japan, Sheindlin said she'll be back at work filming new episodes of "Judge Judy" on Monday. Several have already been taped, and Sheindlin said the best are being frontloaded into the schedule this week. "It's like drinking wine," she said. "You don't serve the really good bottle of wine third."